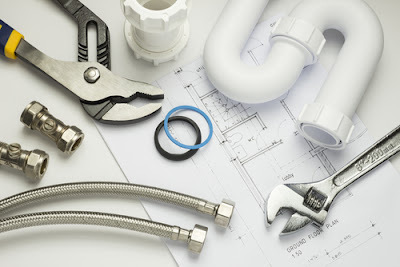 It is often the case that you are led to solve a problem of plumbing by yourself to locate the origin of a leak will not pose you any more problem after having assimilated the good techniques. Our advice will also come to your aid when you should install and replace small equipment without a plumber. Know the exact volume of water loss from its piping using a meter. When the water bill goes up abnormally beyond your average consumption, this can only be a leak. To locate a leak, first turn off the meter for at least 12 to 24 hours. • To stop a leak, turn off the water from your main faucet under the meter. When 12 to 24 hours have passed, you can restart it. • With a pen and a paper pad, read what is on the meter. The indication in m3 is your water consumption. Impossible to miss the other units: hectoliters, daL and liters to the right of the comma. After 12 to 24 hours, note again what it displays and calculate the gap to know your exact rate of water leakage. • After leaving the water meter idle for 12 to 24 hours, reopen it then note what it displays. Also open the tap so that the water can continue to flow without forgetting to keep an eye on your water meter. If your meter keeps spinning, there is a leak somewhere. once the pipe leak has been identified, you should stop the meter again and record the final indication. That's it, you noted what the water meter displayed; it's time to confront the numbers and calculate the gap to find the exact value of water volume loss. Divide this number by twelve or twenty-four, depending on the duration of the break, to find out your actual water leakage rate. • Once all the information elements together: presence of water leakage, flow and exact volume of water loss. You can then go around all your installations and faucets problem to close the leak. How to proceed in case of pipeline leak? When it comes to a water leak, this can not necessarily be anything other than a problem with a pipe or fitting. A leaking fitting, it's easy to repair! Just replace the seal. Any copper pipe clogging operation begins with the cleaning of copper pipe. First, prepare the area to be sealed by wiping it with a clean cloth and then gently sand the pipe on a surface slightly wider than the leak. This will allow you to hang the product easily. To perfect its polishing, it will be necessary to use a metallic brush, a fine wool or a piece of fine emery cloth. Segment the putty first then, mold it. Repeat until you get a mixture of uniform and oily product. Now you are going to apply the putty on the leaking pipe to fill it. The leak zone has been well cleaned. Now you will need to smooth the initially mixed mastic and make sure it adheres perfectly to it. Let it dry as long as necessary. • Fill a leak from a copper pipe with tape: Take a wire brush, a piece of fine emery cloth or sandpaper, and begin sanding the Cu pipe. Clean it with a cloth and do not forget to dry it. Use a hair dryer in this case. Also, prepare the adhesive self-adhesive tape as you will apply it to the pipe. Your connection shows a leak? • When your PVC ring is leaking, it is necessarily defective. You will have to replace it in this case. If it does not show any defect, you do not have to buy it. Simply tighten it! Sometimes the problem also lies at the joint. In this case, you only need to return it to repair the leak or replace it if necessary. Finding where a leak comes from is not as easy as it seems most often. Pipe failure due to direct impact, pipe freeze, manufacturing defect, poor weld quality, micro vibration, water hammer ... all of which can cause a leak in your plumbing system. A minor leakage problem such as a simple seepage can be overcome by the use of a hardener and antifogging tape. 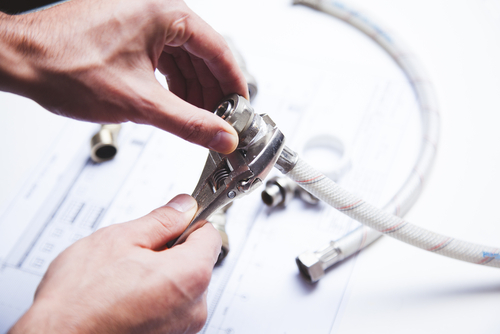 a significant loss of water in your piping can only be overcome by assembling a new fitting. It consists of two separate components: adhesive and hardener which are in solid form. Sold at the store in bars but also in tablets minidoses, the adhesive sealant two-component hardener and adhesive is modulable by the fingertips. The homogeneous and soft ball thus obtained hardens on contact with the air allowing the effective clogging of your Cu pipe. The duct tape is not to be confused with an electrical tape or other types of tape. this one is in fact self-amalgamating; it becomes one with your hose once used to stop the leak. PVC piping: 10 practical tips to solve a water leak problem. First, make sure that no water is flowing upstream of the leaking portion. Cut the meter. The operation begins with the marking on both sides of the damaged part of your PVC pipe. Once done, go directly to cutting with a handsaw, a saw or a hacksaw. The use of a simple knife, a cutter or abrasive paper is here recommended as an alternative to that of a conventional deburrer deemed less effective. Take a paper towel and then dip it in alcohol to clean the sleeves; do the same for all ends of the pipe on 3 to 5 centimeters. It is necessary to thaw the contact areas to perfect the adhesion to your glue. You will need to gauge the damaged part before removing it from the pipe. From the length obtained, you still have to subtract one cm. Prepare the new tube, gently insert it into the jaws of a folding workbench. Mark the cut length with a felt pen. Take your hacksaw, handsaw or counter saw; start by breaking up the tube. Once done, polish the end. Before integrating the new section into your piping, you will need to move slightly away from one of the residual pipe sections. Necklaces that hold the shortest part must be undone to remove it from the wall. • stick on the de-iced surfaces in the sleeves. • Glue the contact surfaces to the end of the pipe and sections of the original pipe. Finally, all you have to do is connect sleeves and tubes. Then have the sleeves inserted at the ends of the replacement pipe, without rotating them. The replacement tube must then be threaded on each side, on both sides. Replace a flush and its mechanism by yourself. Cut the inlet flap on one side of the tank and empty the flush by pulling it out before replacing it. 1. Dismantling a flush is a breeze; first remove the lid! To dismantle a zipper flush, simply unscrew it. To disassemble your good old flush press, untie the thread linking it to the emptying mechanism. Take a wrench or wrench and unscrew the nut directly: the piece that links your faucet to your filling system. You will also need to uninstall the float valve by removing the plastic nut securing it. Unscrew to do this. Rotate 90degree counterclockwise. Do the same to remove the plastic nut and detach the float valve from the tank. The nuts closing the toilet tank on the bowl must be dismantled. You will have to unscrew them! Then remove the screws from above. After dismounting lift the tank and place it on the ground. The used sealant must be removed in its turn. Use a specific key to do this. The cleaning of the ceramic passes before the reinstallation of the tank. you must screw its bottom and also the nut of the new flush system using a specific key to do this. Operate the assembly of the new foam seal in turn; thread the conical washer onto the tank fixing screw, then the same screw last. Tighten the nuts perfectly. Thread a seal on the thread of the float valve and insert the thread into its hole. Reinforce the float attachment nut before installing a fiber seal in the faucet nut. Reattach it manually afterwards. 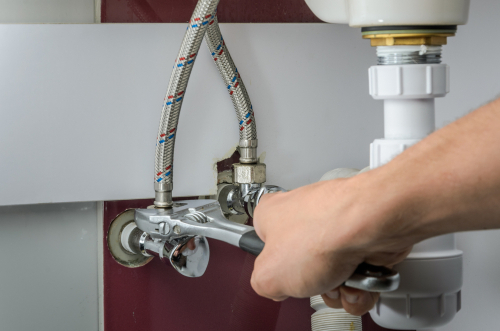 Using a suitable wrench, tighten the nut and hold the faucet at the same time. Adjust the height of the new flush mechanism to the size of the tank. Then mount the mechanism on its base at the bottom of the tank. Secure by turning at ninety degrees clockwise. To secure your electric water heater cleaning operation, it will be necessary to turn off the circuit breaker. Also remove the fuse once it is done. Draining is not necessary for descaling a steatite - resistant water heater while it is vital for the case of an immersion heater. You will need to polish the tank of the electric water heater. For a water heater with an immersion heater, simply restore the platen. For that of an electric water heater with steatite resistance, it will be necessary to raise the sleeve on the resistance and to put it again in the tank. Fill it before reactivating your electric water heater.